The Proctor Silex Company has been around since the 1960s and made a name for itself by creating new and innovative toasters. In 1990 Proctor Silex joined forces with another major small appliance manufacturer, Hamilton Beach. From the rating that below 4 on Amazon we can conclude this is a normal toaster oven. The best advantage buying this oven is saving you quite a lot of money if you don’t need too many functions. If you are looking for something that can toast more than 2 slices of bread at a time and can cook a small frozen pizza, this is the toaster oven for you. 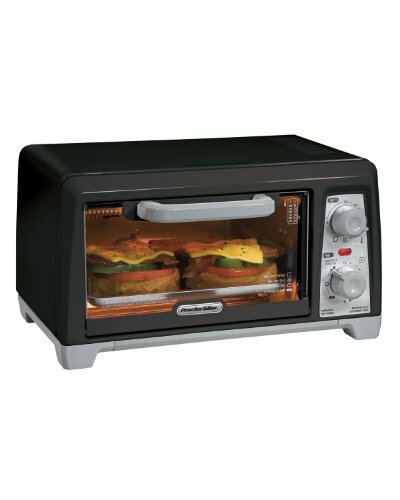 This toaster oven is just less than 10 pounds, measures 13.6 x 16.5 x 9.5 inches, and has toast, bake, and broil functions. Size – It is small enough to work well in a condo, a college dorm or even an RV. It is small enough and lightweight enough that you could actually store it in a cabinet instead of on the countertop. Capacity – You can toast 4 pieces of bread at one time; you can also easily fit breads that are different or odd shaped without having to fit it in a rigid slot in a toaster. You can also cook a 9-inch pizza, broil a couple of hamburgers, and reheat some leftovers. Furthermore, it has a drop-down crumb tray which is not removable, and a bake pan. What Do Owners Say About The Proctor Silex 31111? Some people who purchased this toaster oven liked being able to get it in black instead of the usual stainless steel. It fit in better with their kitchen décor. Other owners who bought this oven also found that although it doesn’t have interior light function, the heating element will create all the light you need when working. Compact and lightweight – Because it is a little smaller and under 10 pounds, it can be used in a college dorm, an RV, and you can store it in a cabinet if you don’t want it to stay on your counter. Price – As one of the more economical models, this toaster oven was basically problem-free and can be purchased at just around $25. A little slower – A few users complained that it took a little longer to toast their bread and cook their chicken. They were used to quicker times but that would have been using a bigger oven. Hot Spots – This toaster oven, like most models, tends to get very hot on the top and sides. Make sure that you don’t store anything on top of it and you keep small children away from it. You should never use your toaster oven unattended. Safety – Some owners said that you need to cautiously pull back the hot grate to retrieve the toast when opening the door. Better seize with tongs. When the knob is set to off it doesn’t feedback a sound to indicate it reaches the correct spot. Few owners also said that on a couple of occasion the timer failed to stop the toaster over making whatever was inside it become ashes. The oven’s manual states to watch toaster and do not leave it alone. It also states that you should unplug after each use. The overall consensus on the Proctor Silex 31111 Toaster Oven/Broiler is that it is worthy of what it is – a simple, basic toaster oven that is easy to use and doesn’t take up much space. If you buy this oven you should pay close attention to the heating element and never leave it unattended.